petition: Revoke Kristen Lindsey's Veterinarian license now. Revoke Kristen Lindsey's Veterinarian license now. 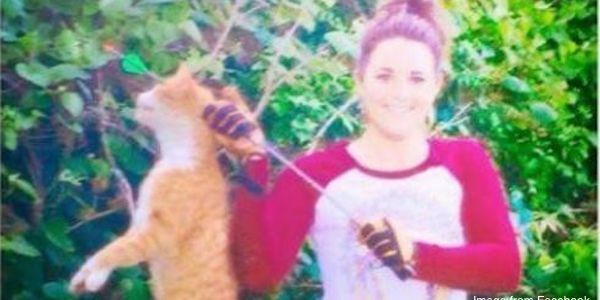 "BRENHAM (April 17, 2015) A Washington County veterinarian is at the center of a social media firestorm, has lost her job, and could face charges, after bragging about killing a cat with a bow and arrow. Dr. Kristen Lindsey, DVM, posted a picture on her Facebook page of her holding an arrow that is sticking through the head of a dead cat. The post reads “My first bow kill, lol. The only good feral tomcat is one with an arrow through it's head! Vet of the year award ... Gladly accepted.'" This petition was created to seek disciplinary action for the behavior of Kristen Lindsey. I am a Registered Nurse and I see no difference in her self-reported behavior and my saying that I drove through town shooting homeless people because they ar a burden on the healthcare system. She is a representative of her profession and your licensing board whether she is at work or not. I think the outrage is more a result of her unempathetic, grandiose, and narcissistic behavior. I think the 22,000 + signatures on this petition show that it is more than just a local concern. This petition was created to seek disciplinary action for the behavior of Kristen Lindsey. The petition author is a Registered Nurse and I see no difference in the vet's self-reported behavior and a nurse saying she drove through town shooting homeless people because they ar a burden on the healthcare system. The vet is a representative of her profession and your licensing board whether she is at work or not. I think the outrage is more a result of her unempathetic, grandiose, and narcissistic behavior. I think the 22,000 + signatures on this petition show that it is more than just a local concern.